Walk along the leafy boulevard of el Prado in Old Havana and you'll find it hard to escape the sounds of construction. At least three major hotel building projects are under way along that stretch of the Cuban capital, including the renovation of the Manzana de Gomez, a former shopping mall being converted into a five-star hotel. With tourist numbers hitting record levels this year, the need for new hotels is self-evident. However, in recent days the Hotel Manzana building project has generated some controversy. Not for its architectural style, which remains faithful to its early 20th Century European influences, nor for its budget or timing - it is due to be completed by spring next year. Rather for the disparity in wages between different employees on the site. The French industrial company, Bouygues, which is building the luxury hotel in partnership with the Cuban state, brought between 100 and 200 Indian labourers to Cuba to work on the project, Reuters reported earlier this year. Tight regulations on how much foreign companies can pay Cuban employees mean that in essence the Indian labourers are being paid about 10 times the amount - estimated at between $1,300-$1,700 (£1,000-£1,400) a month - that Cubans are earning. "It is normal practice for us to bring in our own teams to work on construction sites around the world," a French foreman for Bouygues explained over coffee. The foreman, who only gave his name as Franco, said he had travelled extensively with the company, particularly in the Middle East, and had almost always used teams of labourers who came into the country with the company. But in Latin America employing such a foreign labour force is relatively rare and in Cuba it's almost unheard of. Initially neither the presence of Indian employees or the wage differential was considered especially controversial. Rather it was the government's explanation, which took several months to emerge, that seems to have infuriated people. In an interview published in the state-run newspaper, Juventud Rebelde, Jose Martinez, deputy director of Cuba's construction and real estate company Almest, linked the higher wages to the Indians' productivity. "The Indian workers' level of efficiency in construction work is three or four times greater than the national average in Cuba," he said. "Their work always produces very high-quality results… they make the most out of their working day, which results in greater productivity." Unsurprisingly, that was met with indignation by scores of hardworking Cuban labourers. "If you paid us [the same] we'd build the Manzana de Gomez four times over," said Yanquiel Jardines as he ate his lunch on a building site in the Vedado district of the city. I asked the 25-year-old state employee and his older colleagues about the Juventud Rebelde article as they smoked and drank sodas on their midday break. By and large, they say, they don't resent the fact that the Indian workers earn higher wages. Instead, they value the stability of their state jobs over the better-paid but more "sporadic" work in the private sector. "This is working towards my pension and I know I'm working again tomorrow," says Rolando, who's spent more than 20 years on building sites. "But those guys in the 'brigades' [on private sector projects] don't know what will happen when the job they're working on ends. They might not work again for months." What did anger them, however, was the suggestion that they aren't as efficient as their Indian counterparts - or any other nationality, for that matter. 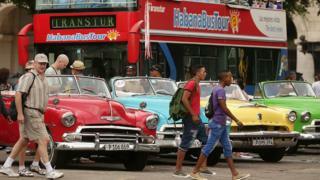 For many Cubans, the issue of employment with foreign companies gets to the heart of their questions about how the rapprochement with the United States - and the subsequent boom in tourism - will benefit them. Will foreign investors be permitted to hire Cuban workers directly instead of through the state employment agency? And will they receive wages at an "international" market rate? The city's historian, Eusebio Leal, is the man behind the renovation of much of Old Havana. In a recent interview with the BBC he spoke about the Hotel Manzana pay issue saying: "130 or 140 labourers that this company [Bouygues] brings in are not going to determine the reality of the internal labour market in Cuba." Meanwhile, Almest says it is undertaking a study to create a new system of payments, one more closely linked to productivity. That may not placate some state construction workers though; already they are earning less than their co-workers, and now their pride is dented too.